I. Christ’s open door. The figure here is probably similar to those expressions in which Paul speaks of ‘a door being opened to him of the Lord’ (2 Corinthians 2:12); of ‘a great and effectual door being opened’ (I Corinthians 16:9); of ‘God opening a door of utterance’ (Colossians 4:3). In one aspect it as the door of service, and labor, and opportunity; in another, it is the door of success, and blessing, and power. It is the door both of service and success. 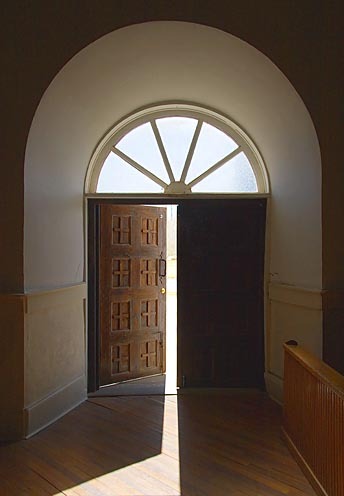 It is an open door, not requiring even to be knocked at, but thrown wide open, that the Philadelphians might enter in at once, and without obstacle. Christ, when He comes to men, finds a closed door; so He has to knock; but ‘before them’ He sets an open door. It is right before them, immediately in front; for this seems the true point of the word. They have not to seek for it; it is not far off nor hidden, but just before them, thus open, by Christ Himself. He who has the key of David has unlocked it and thrown it wide open. Christ with His own hand has opened it, and with His own finger points to it, saying, ‘Go in!’ Christ has thus two open doors—an open door for salvation, and an open door for service. Go in, He says to every loiterer on the outside; Go in and be saved. See there, just before you is the house of salvation. I have set it before you open, and no one can shut it (either man or devil.) Go in, He says also to each Christian—Go in and work. See, right before you is the door of service. I have set it open, and no man (or rather, ‘no one,’ whether man or devil) can shut it.